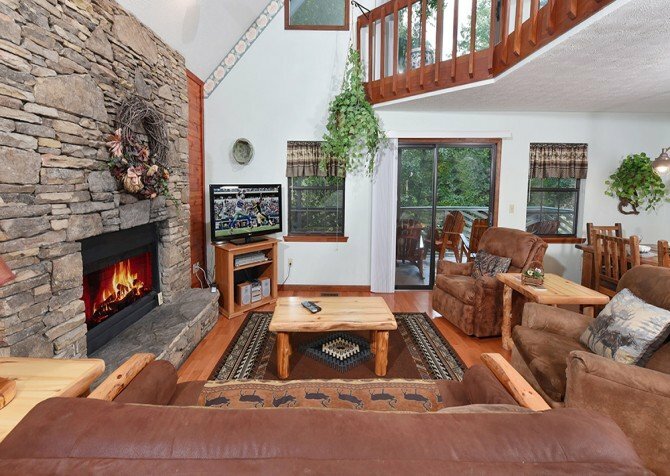 Located in a beautiful wooded area, Lorin Aleah offers both a semi-private location and mountain views. This pet-friendly cabin rental is a spacious one story property that provides two bedrooms and one bathroom. 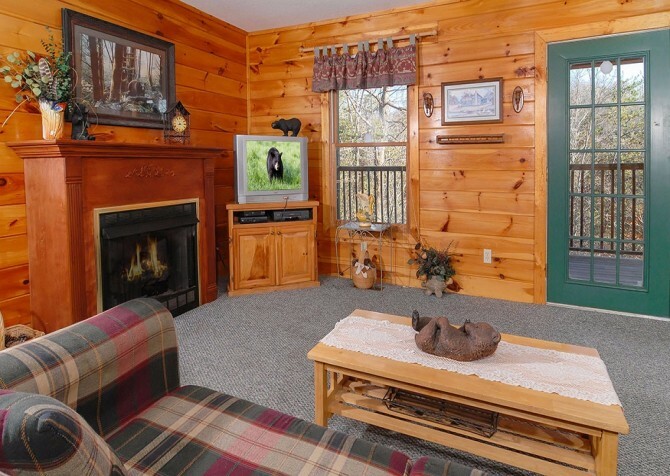 While boasting a semi-private location, this Smoky Mountain rental is also located less than three miles from downtown Pigeon Forge. Being only minutes to the popular tourist attractions is beneficial because you will waste no time in traffic waiting to get all the excitement of sightseeing started. With the paved parking spaces, carrying in luggage will be simple and quick. Upon entering this cabin, you will notice the cozy living area with nice décor that many of our guests love. Many rental properties can be over-decorated, but at Lorin Aleah, it will feel like you are stepping into someone’s home. 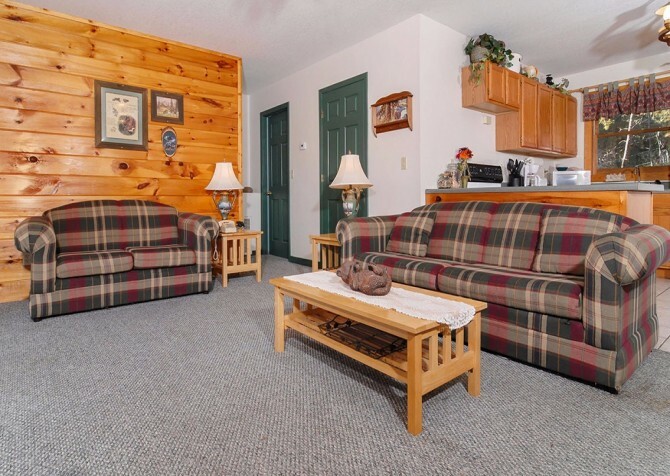 You will feel comfortable and at home here. 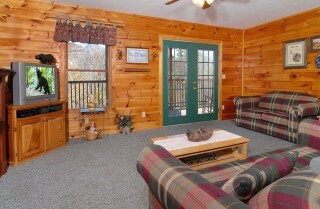 There are two sofas in the living area, a coffee table, and two side tables with lamps for ambiance. 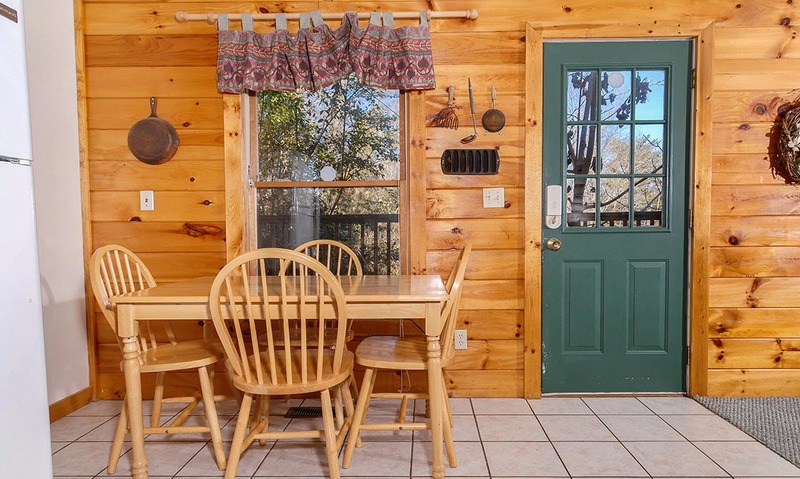 This Smoky Mountain kitchen is fully equipped and prepared for anything. 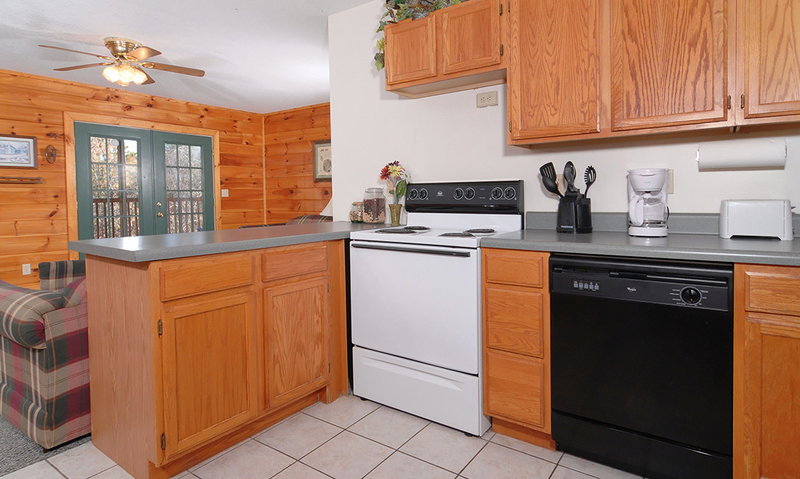 There is a stove/oven in the kitchen so that you can bake dinner while also preparing your sides on the stove top. You will find a coffeemaker in the kitchen if you need a jolt to start your day. A toaster will allow you to make a quick breakfast to take on the go while sightseeing. In the kitchen, you will also find a full-size refrigerator, a microwave, and dishes to use for every meal you prepare. The cabin even has a washer/dryer to make longer stays more convenient. 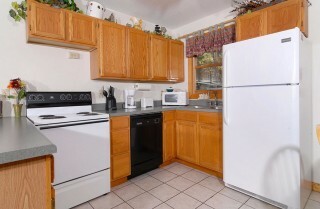 Moving over into the next area of the kitchen in Lorin Aleah, you will find the dining table. Set in front of a picture window, this dining table offers a great view of the glorious outdoors. This hardwood table is light brown and has matching chairs. The dining table offers room for four guests to sit and eat a nice meal in the peace of the cabin. 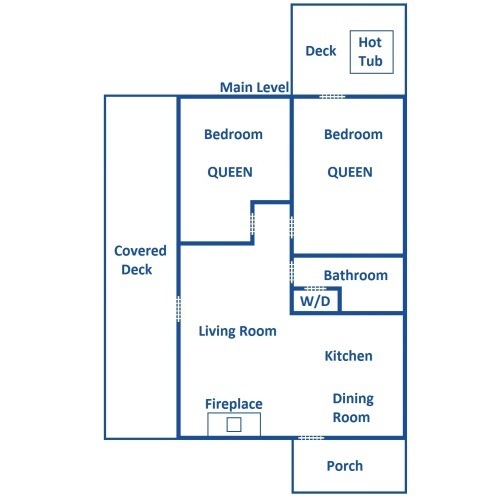 If additional seating is needed, the living area is just a few steps away. 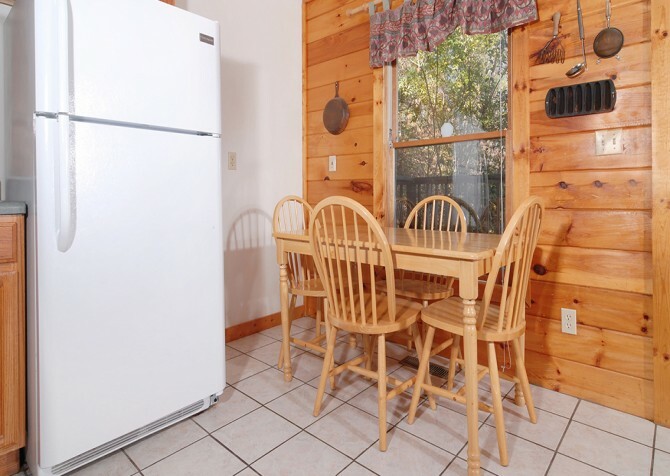 Additional guests can sit and eat in the living room while visiting with those in the dining area. The front entrance to Lorin Aleah is located in the kitchen. The front door goes out onto the front porch that leads to the driveway. 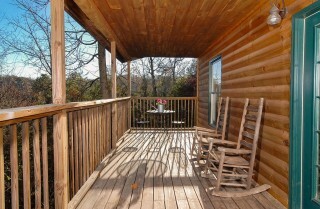 The beautiful wooded and mountain views can be found by looking off the front porch. 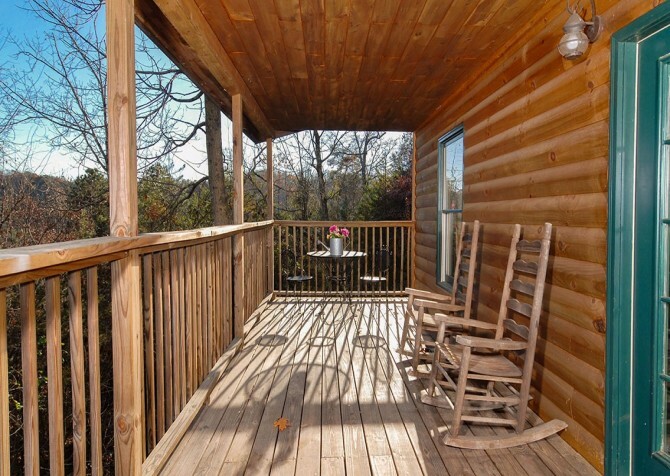 The porch wraps around most of the cabin and allows you to have a panorama view. The first bedroom has two picture windows that offer a lovely view of the mountains and an abundance of natural light. The bed is queen size and the lush bedding invites you to enjoy a restful night. 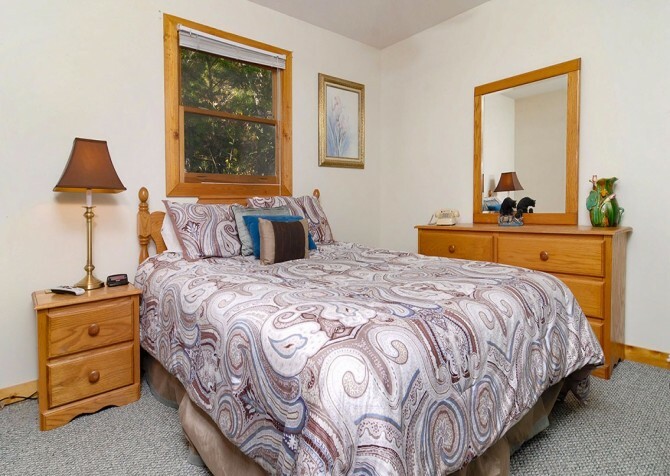 The room is made complete with a dresser to fit all of your vacation wear, a night table to put some of your accessories in, and a lamp so that you can read as you go to bed or dim the room for a nap. The second bedroom offers a queen size bed, a dresser with a large mirror, and a night stand with a lamp. 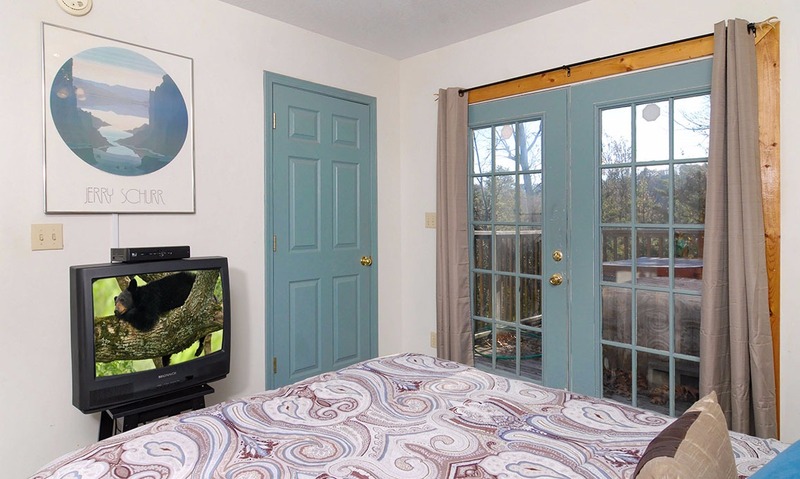 This bedroom also offers a set of French doors that lead to the deck, a TV, and a closet. 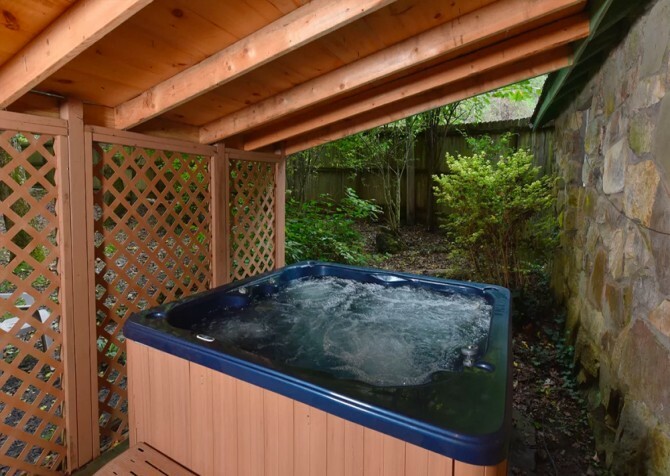 Stepping out of the French doors, you will find the hot tub where you can spend a few hours at night after seeing the sights of downtown. 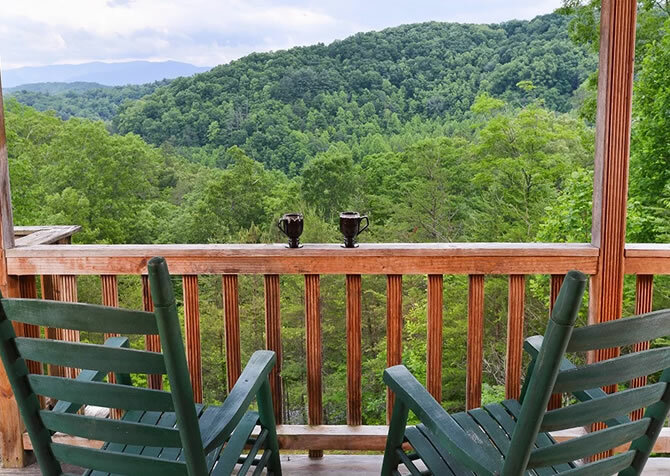 If you are looking for nearby attractions that will give you an authentic Smoky Mountain experience, there are plenty nearby! The Island is a family-friendly attractions complex. This is a newer addition to Pigeon Forge, but it is quickly becoming very popular. With many celebrity restaurants opening soon, including Paula Deen’s Family Kitchen, this is an attraction to check out! 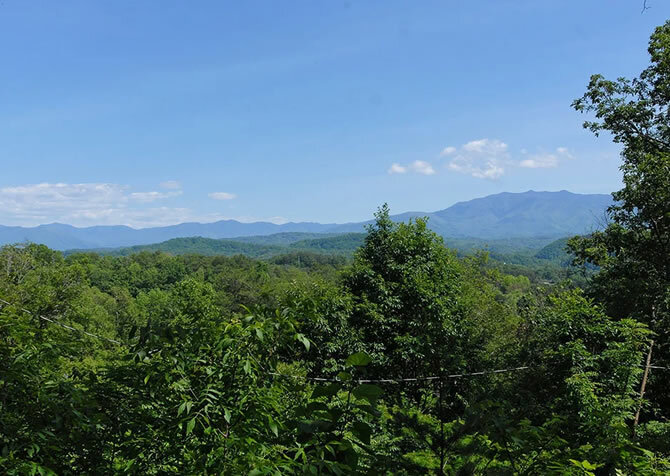 A Ferris wheel at the center of The Island provides spectacular views of the whole town, so you can get a look at everything Pigeon Forge has to offer. Questions or comments? 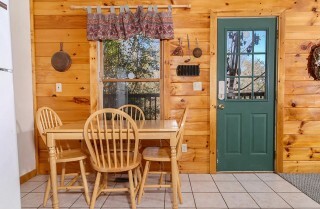 Call 866-513-7885 to speak to a reservation specialist today! "Really enjoyed the cabin! It's a real nice, quiet place to stay." 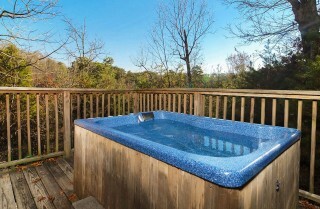 "My family and I enjoyed our recent stay at Lorin aleah. 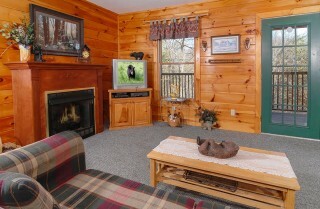 The cabin was nicely decorated and comfortable for my family of 5. 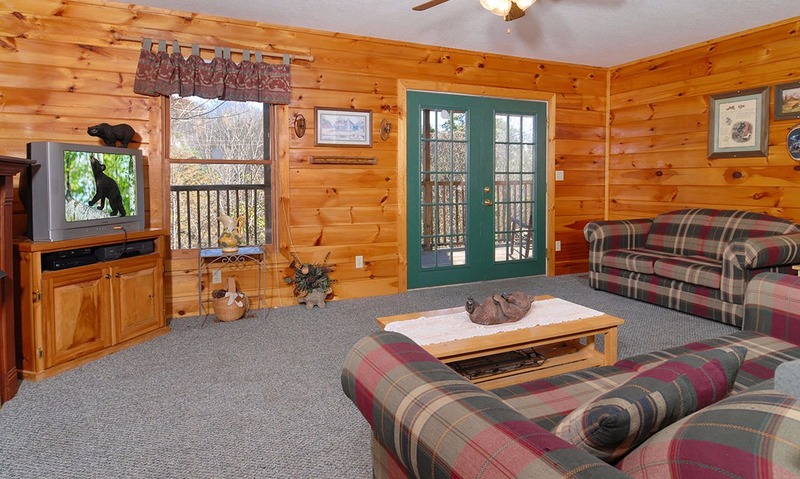 It is only minutes away from all the attractions of Pigeon Forge and Gatlinburg. It is not overly extravagant, but it was exactly what we were looking for. The price was just right for our budget too. 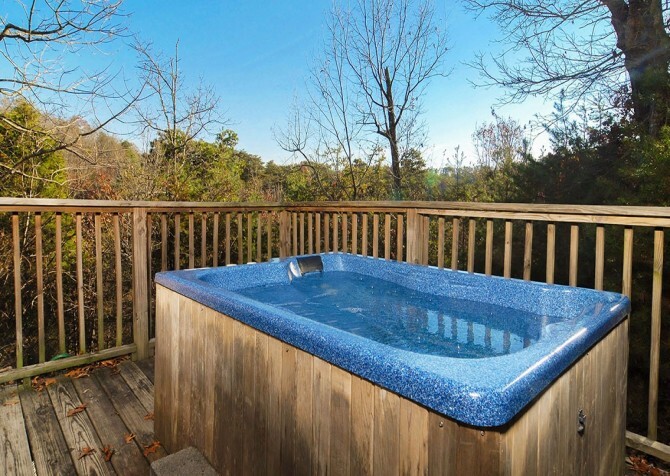 We spent our mornings sitting in rocking chairs out on the deck just taking in the mountain view and spent our evenings relaxing in the hot tub. We look forward to spending time here again soon!"